Award winning British audio brand VQ are pleased to announce an expansion to the colour range of their Retro Mini DAB/DAB+ Digital Radio & Bluetooth speaker to include six new contemporary shades all of which make ideal hue companions for the Pantone Colour of the Year 2018 – Ultra Violet. 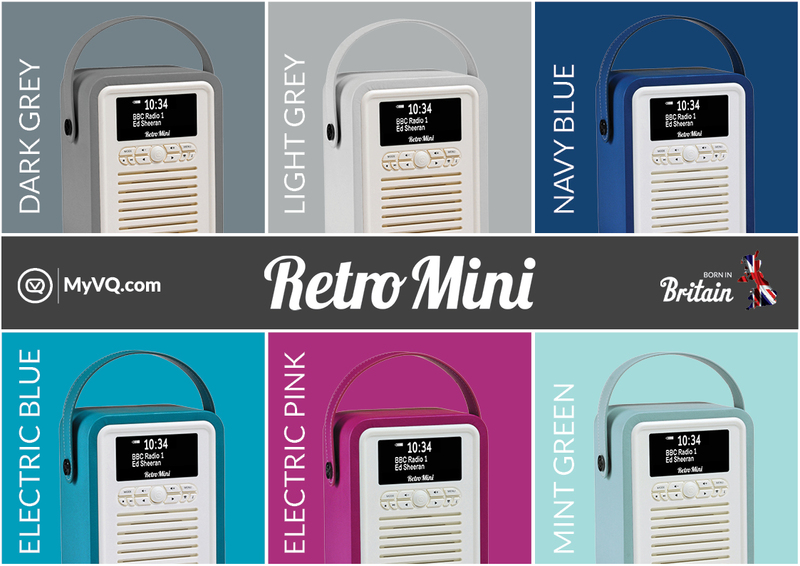 The Retro Mini range is available now from VQ, Amazon and other leading electrical retailers priced at £69.99. VQ is an independently owned British audio brand, born out of a desire to create products that perfectly combine Sound & Style. The multi-award winning product range is all designed and engineered at their UK headquarters. Colour and design detail is an essential part of the VQ identity, for far too long black and silver boxes have been the de facto choice for consumer electronics – but VQ see their radios as an essential part of interior décor. A feast of the eyes as well as the ears. This press release was distributed by ResponseSource Press Release Wire on behalf of View Quest in the following categories: Women's Interest & Beauty, Consumer Technology, Retail & Fashion, for more information visit https://pressreleasewire.responsesource.com/about.